Confession: I don't drink enough water. Do you? I don't know why it's so hard for me. I struggle with water consumption every day! I have a gazillion water bottles, but I only use them successfully when I'm working out. Otherwise, I totally forget about them and the water they're holding for me. 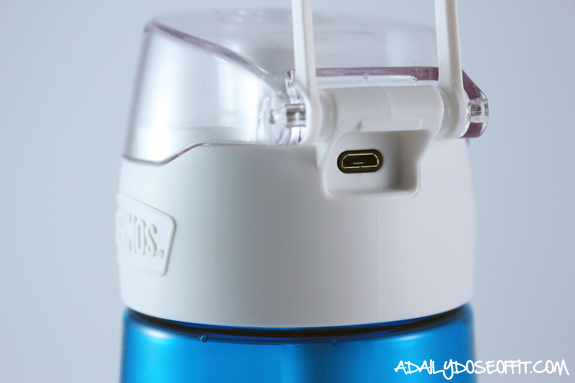 So when Linqia reached out behalf of Genuine Thermos Brand with an opportunity to review the new Thermos Connected Hydration Bottle, I accepted because #hydrationgoals. This water bottle is seriously cool. 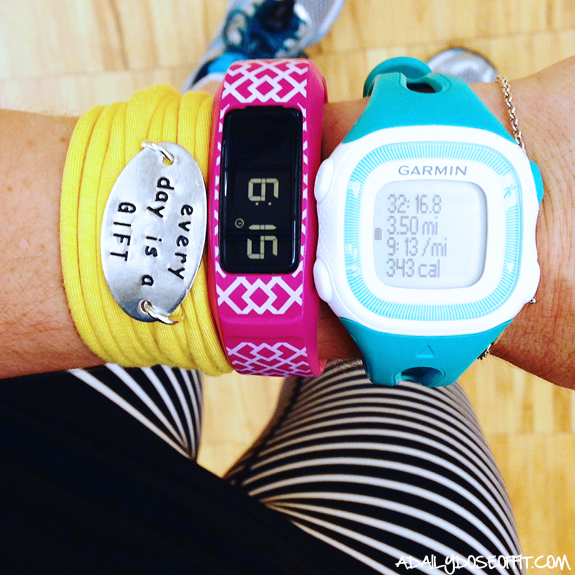 It would be a great gift for your favorite fit or tech-obsessed friend. Or anyone that wants to meet and exceed their hydration goals. I know what you're thinking: How will this water bottle make a difference if I can't manage to use the gazillion bottles (total exaggeration, by the way) that I already have? What makes it seriously cool? Get this: It has a Smart Lid. See that port right there? That's how you charge the internal battery. 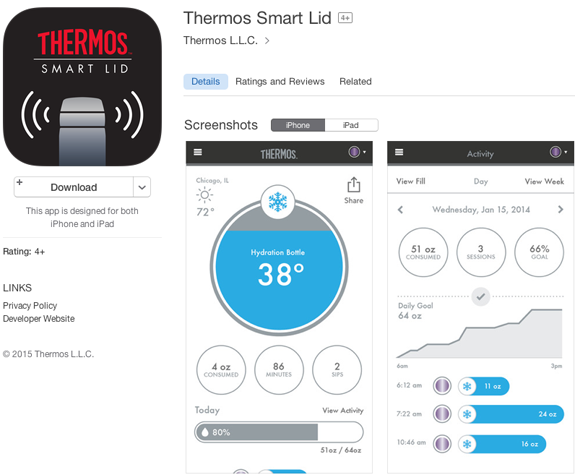 The app itself is compatible with a variety of Apple products that use iOS 7 (or any subsequent versions). It's free and totally easy to set up. First, you have to identify your hydration goal based on age, gender, height, weight and activity level. Then, you just sync and drink. The Connected Hydration Bottle does the rest. It tracks the amount of water I've consumed throughout the day, providing the number of sips I've taken, individual sip size and total ounces consumed. It also tells me how cold my water is. And if it's been too long since my last drink, the app will notify me that it's time to gulp some water down. Back up, though: Why is water so important anyway? Because without it, our systems wouldn't function quite like they should. Hydration ultimately increases energy levels, regulates circulation, aids digestion and improves skin quality. Picture a car without gas. Or the desert sans rain. It's just really important to stay hydrated. And yet, it's so hard! But a water bottle that keeps track of my hydration goals? How fun. And how useful! 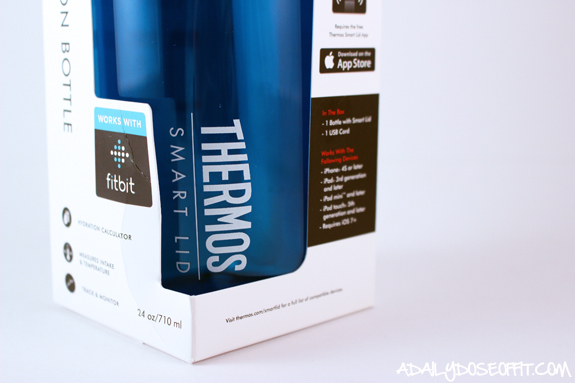 The Thermos Connected Hydration Bottle with Smart Lid is a totally new way to stay hydrated. 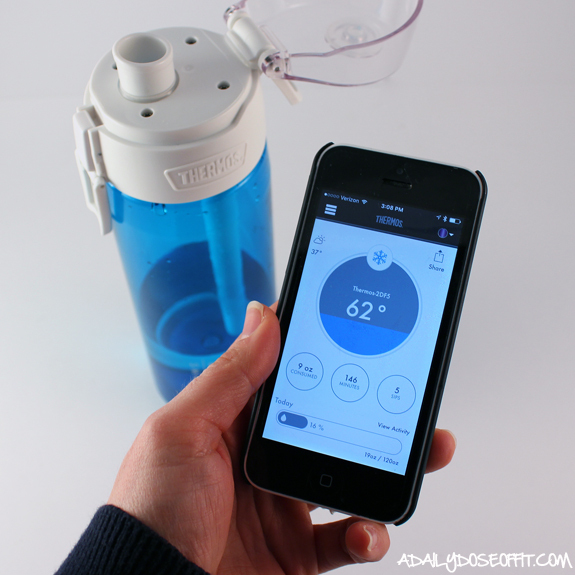 It holds 24 ounces of water, and the bottle itself is BPA-free and impact-resistant. At $59.99, it's a bit expensive, but most tech-based gear is. 'Tis the season to splurge on awesome gifts, though. Right? 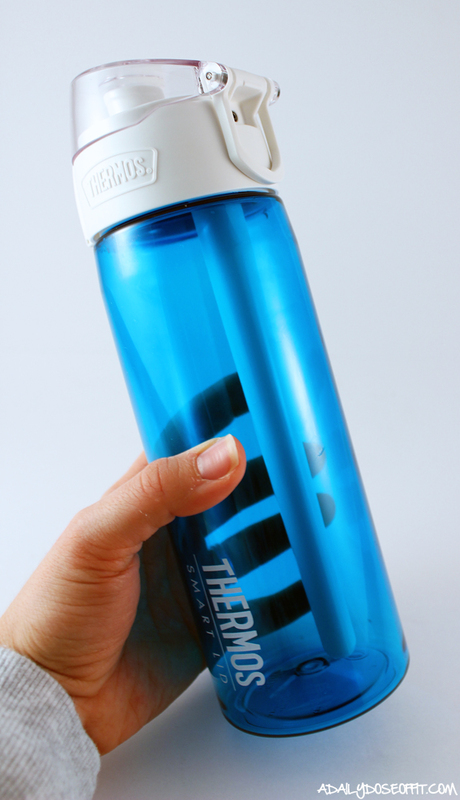 To find out more about the Connected Hydration Bottle, you can check out Genuine Thermos Brand on Facebook, Twitter, Instagram, Pinterest and Tumblr. 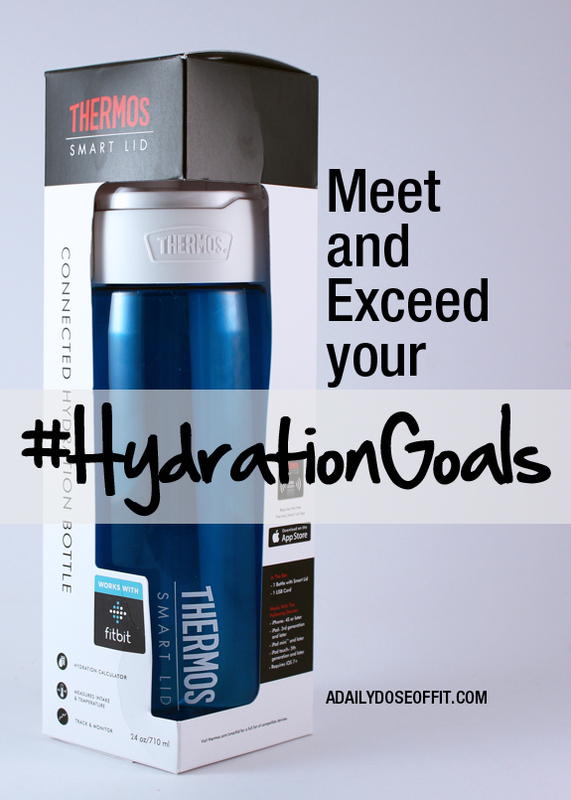 And if you search #hydrationgoals on any platform, you'll see the bottle itself in use. Of course, you can follow me on Facebook, Twitter, Instagram and Pinterest. I'm sure you'll see a lot of the Connected Hydration Bottle there, too. 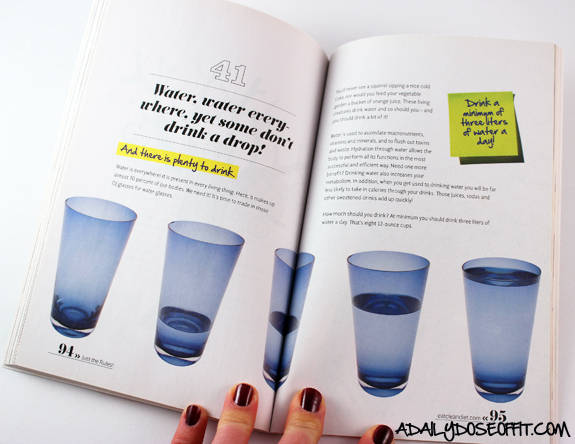 Question: Do you drink enough water? 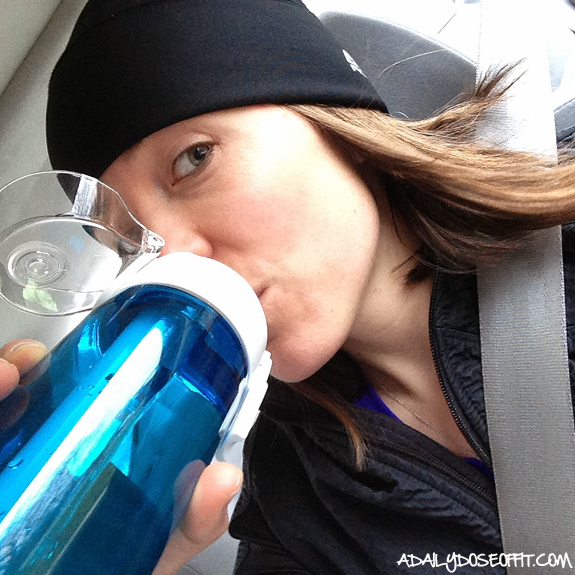 How do you keep yourself focused on hydration? How do you think this product would help you? Today is my birthday. I am 35 years old. I accept this age wholeheartedly. I know it sounds cliche, but age is just a number. I don't feel 35. What is 35 supposed to feel like? Can it really be defined? I just feel happy, healthy and thankful for every single one of my years and the promise of more to come. And then I snuck into a Power Yoga class for some flow. 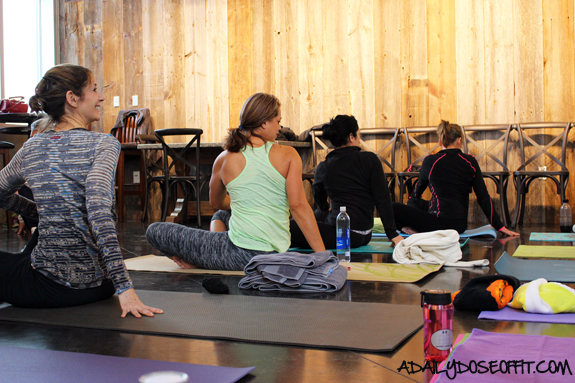 I can't normally get into any of the yoga classes because I'm either training, teaching or meeting with people. But today, my schedule was wide open so I made it happen. With elements of yoga in my beloved PiYo Live class, and my recent adventure doing yoga at a winery, I'm newly energized to keep practicing. We'll see how that goes. To honor both events (because every birthday is an event, no matter what you think), I thought it would be fun to reflect on 35 things that I am extremely thankful for. Some are completely serious, others are a bit light-hearted. They all make me happy. Top three. Needs no explanation. We are lucky to have four people in our lives that support us no matter what. They are our rocks from which we've learned so much that has and will continue to propel us through life. The best. All of them. Because never a dull moment. 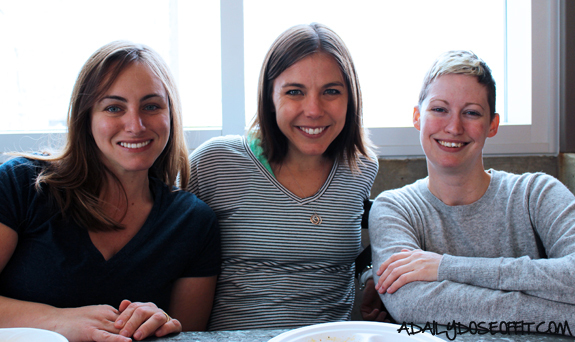 Sisters from other mothers, for real. Seriously, fitness has given me so much more than good health. It's given me a career, a work family and a home away from home. Every time I show up to work, I feel an overwhelming sense of gratitude. I get to share my passion with others on a daily basis. I get to help change lives, and in turn, my life is changed, too. I get to share smiles, jokes, laughs and sometimes even tears with people pretty regularly. It's incredible, this industry (and this gym) that I am a part of. This year was super great for A Daily Dose of Fit. I worked with some really awesome brands, attended BlogFest and IDEA World (dream come true), and met some fantastic people along the way. I don't write for the money or the free products, both of which are an added bonus that I am extremely appreciative of. I write because I love to write. And I love to write about fitness. Bringing the two together in one creative place has been an enjoyable adventure that I never take for granted. I used to hate running, and now, it's my therapy. Running is so much more than clocking miles or getting medals. It's about perseverance. Proving to yourself that you can and you will. It's about making friends, and joining a team...runners band together, even when they're running against each other. I see it when I run with my club, and I see it when I read Runner's World (which is my trusty go-to for inspiration when I don't feel like running). I had no idea how much this class would change me. 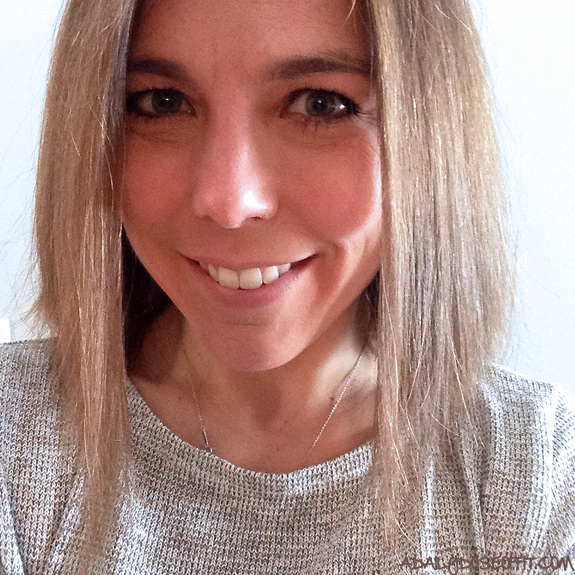 I took the certification course just two months after I had Evan. I was weak and full of baby weight. PiYo Live literally whipped me back into shape. Not immediately, of course. But over time, I noticed a huge difference in terms of muscle tone, general strength and flexibility. It's also given me a huge confidence boost—trust me, memorizing 60 minutes of activity and delivering it in front of a huge class is no small task. I wasn't sure if I could do it, but I did...and I do...and I'm better because of it. Pretty sure my husband is thankful he bought this book for me because I am finally weeding through all the crap that's been collecting dust. So much stuff I don't need! The more I get rid of, the lighter and happier I feel. Go buy the book. Just do it. Who ISN'T thankful for T.J. Maxx? I won't let a day go by without giving thanks for these three things. Because out there, people don't have these things. These common things we should all have. Because without it, the things above wouldn't be nearly as joyful as they are. Me, I'm blessed. And I remind myself of this every single day. 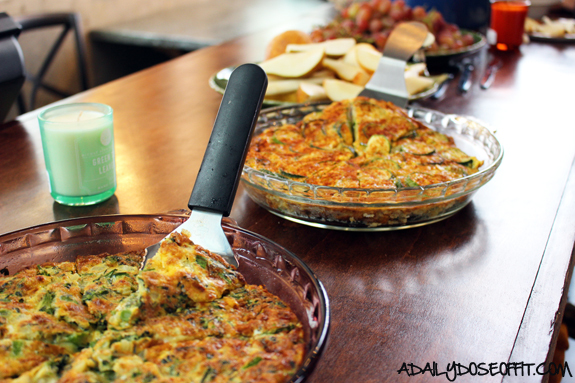 To see what my friends are thankful for, visit #thefitdish linkup. Question: Tell me one thing you are extremely thankful for today. It's officially Winter up here in Michigan. We've had a relatively mild November, but it's promising to go out with a bang—snow fell on Friday night. We woke up to a few inches, just enough to send us all out for new boots, coats and ice scrapers. In true fashion, I woke up to run a few miles with my running club. I doubled up on the socks and picked my fleece-lined tights. The sidewalks were covered, and my feet felt like icy sponges fairly quickly into it. But it was a beautiful run, nonetheless. Five miles of Winter bliss: Snow-covered trees, ice-capped sand dunes. a quiet and quaint beach town. And me, running through it. 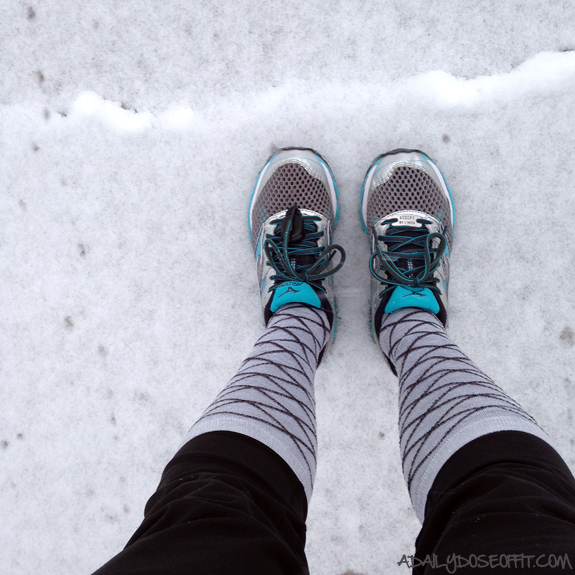 Truth is, I'd choose running in the snow over running in high heat, hands down. There's something so relaxing and peaceful about it, I think. You just have to get the layers right. Or do yoga by a fire when you're done. 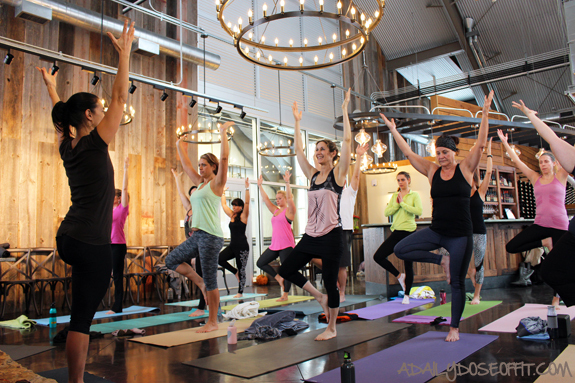 After a quick post-run shower, I headed out to Dablon Vineyards in Baroda for an awesome yoga event hosted by one of my favorite yoga instructors. 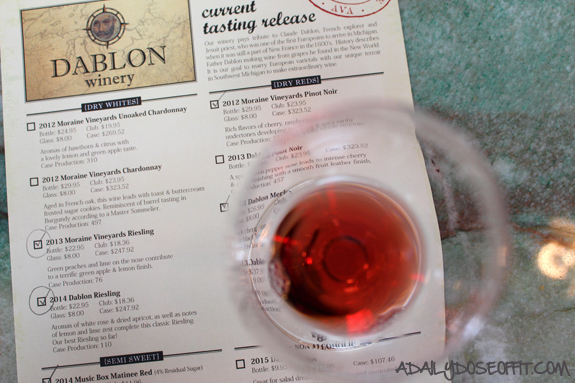 Here in Southwest Michigan, we have an overabundance of delicious vineyards complete with picturesque tasting rooms. And honestly, I've probably only been to half of them. So when I saw that Dablon was hosting Maria (aforementioned favorite instructor), I signed up with a few friends. I hadn't been to Dablon yet and felt this would be the perfect opportunity to change that. We started out with a short meditation to let go and be thankful. Then we proceeded into our practice. 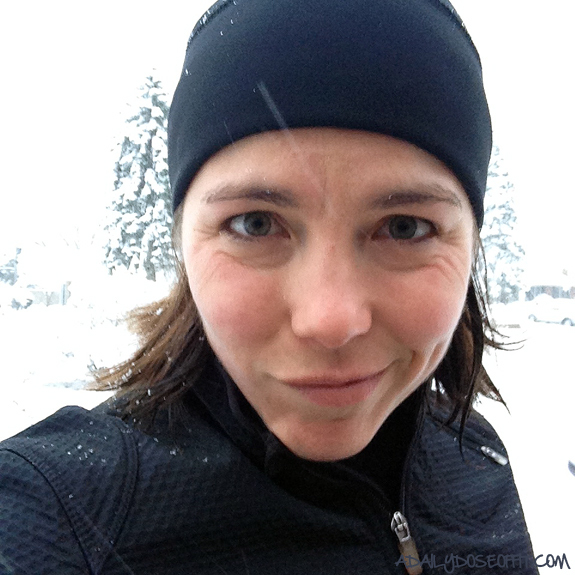 I was particularly grateful for the downward dogs after my run through the snow. I rushed to get home, so I didn't stretch as sufficiently as I should have. Translation: I needed this yoga class. 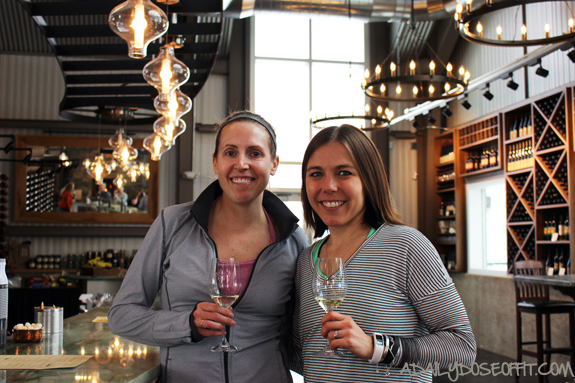 You might think that wine and yoga don't go together. Balance poses in a beautiful atmosphere, completed by the promise of wine. So good, all of it. Made even better by great company. So much fun. The best, really. I've been a certified personal trainer for almost six years, but my personal experience with exercise goes way back to college, really. That's when I first got into it. And when I think back to all of the workouts I've done, there is clearly a short list of go-to exercises that always get the job done. Today, we'll talk about one of them: Planks. Who doesn't love a good plank? We do them in every single one of my classes...with the exception of Spinning, obviously...and I make every single one of my clients do them, too. In fact, one of my clients is inspiring this post and she doesn't even know it. A few weeks ago, she was telling me about an article she read in Muscle and Fitness Hers. (Good choice, lady! A shout-out because I know she reads Daily Dose.) 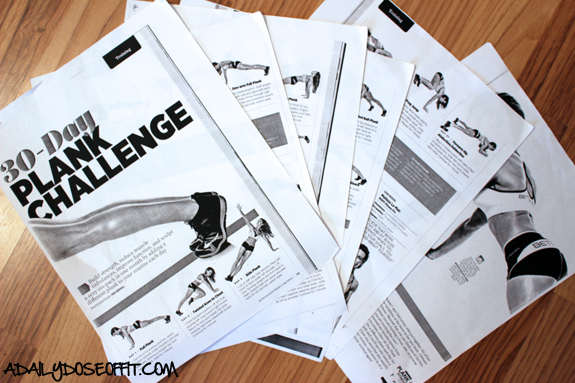 It was a 30-day plank challenge that provided, you guessed it, 30 different planks. She brought the article in and I photocopied it. I told her she might regret sharing the article with me. *Insert evil laugh (and a smile) here. * But I'm so glad she did because it reminded me of so many planks that I had forgotten about, and it also taught me a few new planks, too. Seriously, if you're not doing planks, you should! They literally engage almost every muscle in your body. And no, it doesn't matter how long you can hold it. What matters more is that you try, and that you're doing so with the right form. Here's what you need to remember: Keep your head, shoulders, hips, knees and ankles in one straight line. Tighten your abs and breathe deeply. Spread your fingertips apart to create a nice, solid base below your wrists. And finally, do your best to relax into the position without losing form. 10 seconds, 10 minutes...start where you can and build from there. Should any of the above apply to you, you'll need to proceed with caution. I'm not saying you CAN'T do planks, but you might want to ask for guidance before you try. Consult with your physician or a certified personal trainer. Both will be full of information. It's as easy as lifting the opposite arm and leg at the same time. But it's not so easy to hold. Too much? Start with one arm. Or one leg. Gradually build up to both at the same time. Oh, the exercise ball! Such a simple piece of equipment, and yet, it makes core exercises so evil! If you reference the picture above, it looks like a simple forearm plank on an exercise ball. But really, you're in motion as you "stir the pot." Translation: You move your forearms in a small circle. So much harder than it looks! To progress, start with a BOSU (dome side down). Or maybe a medicine ball. Both of which put you closer to the ground and give you a slightly more stable surface on which to rest your hands. Planking with your feet on the exercises ball can be a challenge in and of itself. But if you've mastered it, you might start toe-tapping the ground. Alternating sides, of course. Again, much harder than it looks because you can't lose control of the ball. You can do these without the ball to start, then move up to a BOSU (dome side up), then finally move up to the exercise ball. Seriously, though...there are so many plank variations out there. More than 30, for sure. Some of them get tricky, so you need to be careful. Never work beyond your fitness level—that's where injuries happen. Push yourself, but don't push yourself over the edge. Oh, and—don't forget that it's #wildworkoutwednesday! Click the hashtag for more fitness inspiration. 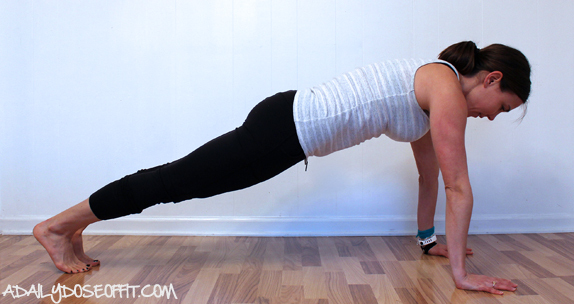 Question: What's your favorite plank variation? What do you think is harder: Forearms or straight arms? 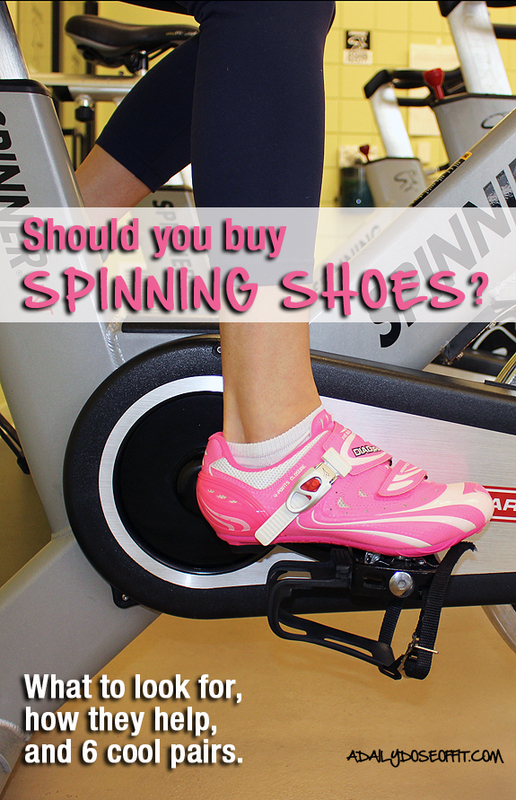 Should you buy Spinning shoes? I've had my pink Spinning shoes for years and they, to this day, are perfect. I don't ride without them. Yesterday, I taught a 45-minute endurance ride (my personal favorite). And today, I thought it would be fun to educate you on the benefits of riding in Spinning shoes. Specifically, what to look for and how they help. 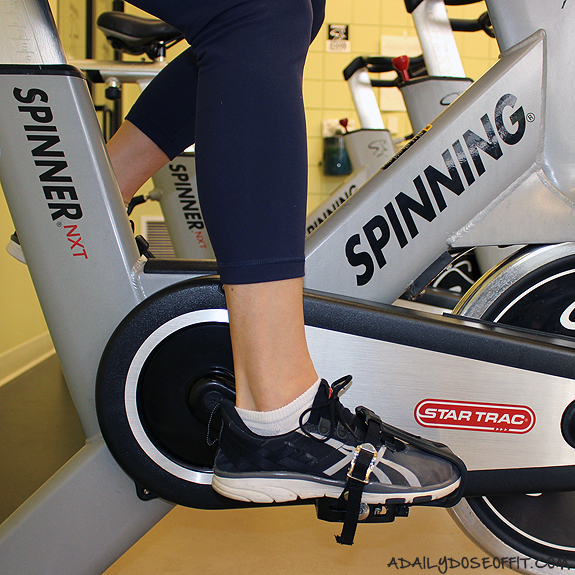 You might already be doing this, or if you're a Spinning newbie, you can rest assured that you won't be the only one in regular shoes. But, are Spinning shoes right for you? My answer is "yes, absolutely...if you take classes regularly." It's absolutely worth the investment if you frequent the saddle. Consider this: Spinning shoes are worn in a relatively clean and confined studio. So wear and tear is minimal. Bike shoes are not at all like running shoes. They don't need to be replaced after a certain number of miles. They just need to fit comfortably and securely for as long as you're using them. 1) The sole of the shoe. As you can see, the soles of my Spinning shoes are smooth. A lot of road bikers have this style, and the three-hole clip system is preferred. 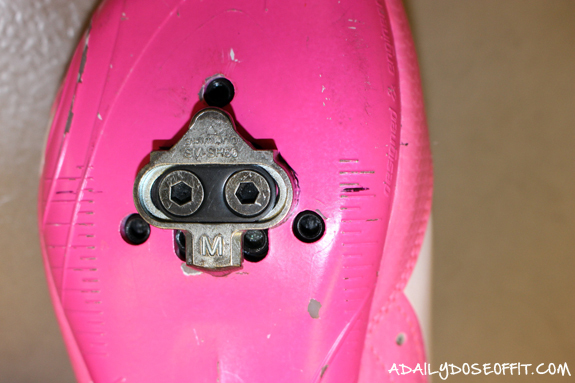 But most Spinning bikes use the two-hole clip, otherwise known as an SPD clip, which is what you see on my shoe. I'll be honest: My shoes sound like tap shoes when I walk around the studio. It's not the safest option, but I'm not walking long or far in them, so it works for me. If you're prone to falling or have conditions that require extra caution, or if you just don't want to worry about it, get cycling shoes that have rubberized soles. The clip is recessed, so you won't even notice it. Which one to choose? To each his own, as long as your choice is compatible with the necessary clip. Oh, and—you want them to be comfortable, specifically in the toe box. Spinning shoes aren't super padded, which is fine because impact is minimal. You want a bike shoe that holds your foot securely with plenty of wiggle room in the toes. Beware not to pick a shoe that's too loose, as your foot will fly right out of it, which could lead to injury. Always, always properly tighten your Spinning shoes! If your feet ever go numb, then your shoes are probably too tight. 1) They're quite breathable, and we all know how awesome airflow is in a Spinning class. 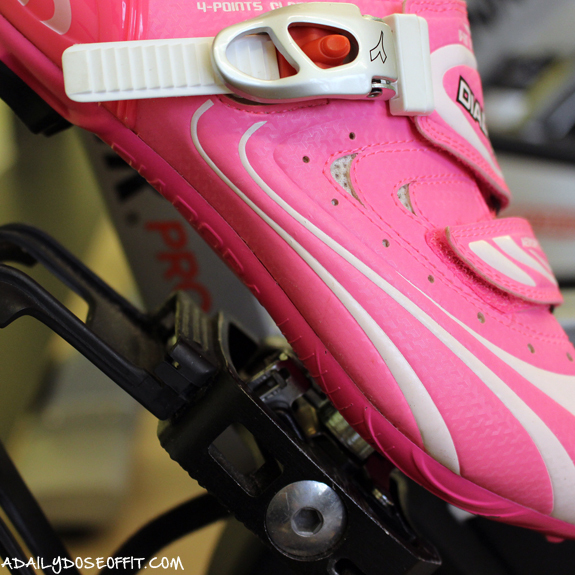 2) The stiff sole helps you put more power into your pedaling. 3) They secure your foot to the bike which increases stability. 4) With your feet attached to the bike, you can focus on engaging more leg muscles. 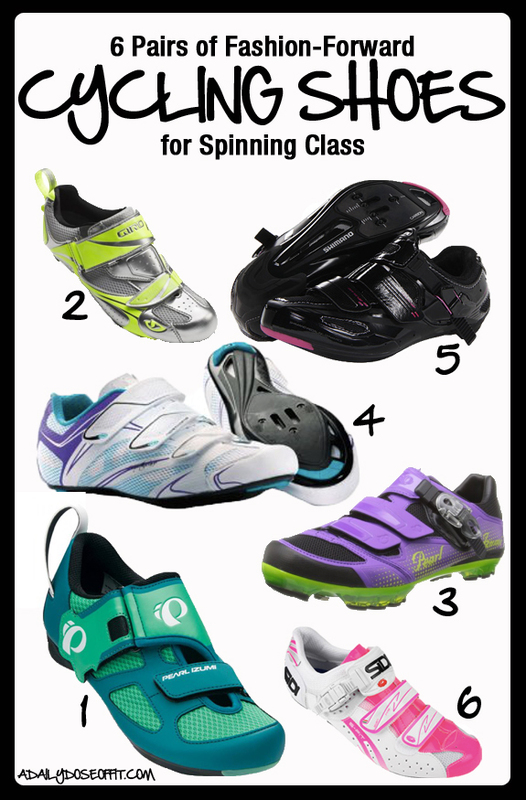 Bottom line, if Spinning is your thing and you aren't wearing bike shoes, you should get some. I promise it'll enhance your workout. A new instructor at my gym finally got himself a pair and said to me, "woah...yeah, such a huge difference." 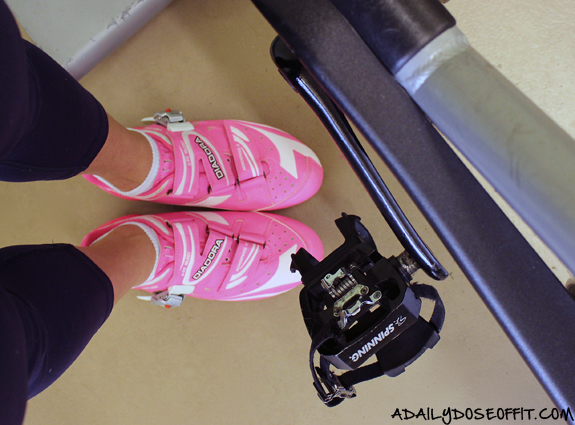 Question: Do you ride in cycling shoes? Can you remember what it was like the first time you clipped in? This morning, I returned to my 6:00AM HIIT class because the current instructor needed a schedule change. I didn't even hesitate. Teach good people my favorite format? Yep. 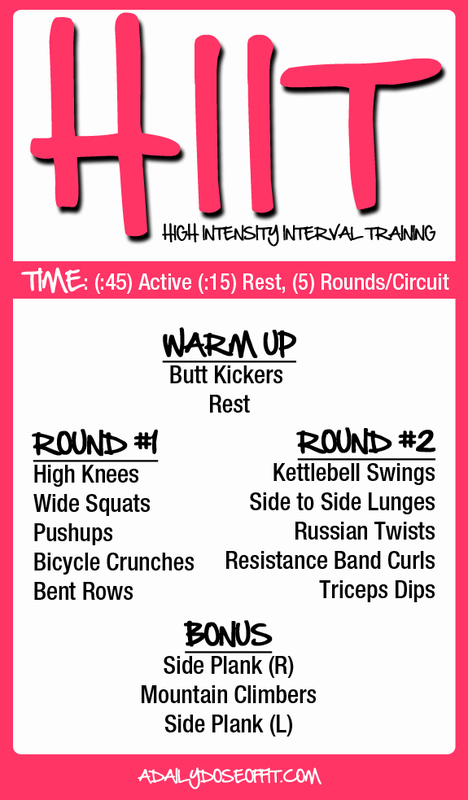 Today, since it's #wildworkoutwednesday, I thought I'd share our workout. But first, what is high intensity interval training? Let me give you the basic answer from the American Council on Exercise: HIIT is a "cardiorespiratory training technique that alternates brief speed and recovery intervals to increase the overall intensity of your workout." Boom. Fun stuff. Please note: Before you try anything new at the gym, you need to check in with your physician. Especially when you're increasing the intensity. This style is not necessarily right for everyone as it does really push you to a max intensity that might not be familiar. 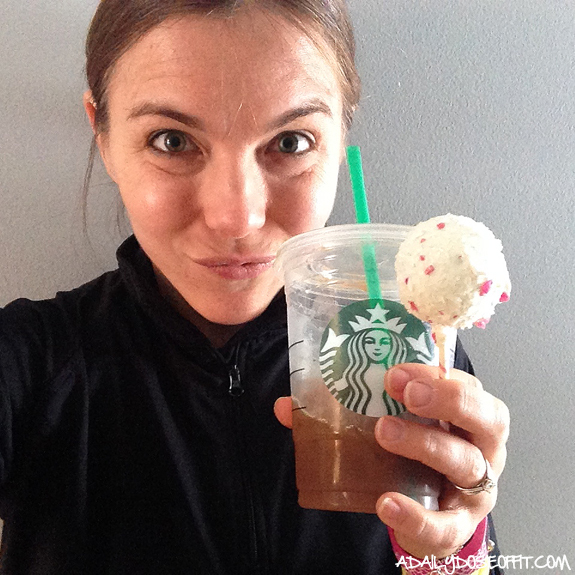 I am an ACE-certified personal trainer, but that doesn't mean I know what's right for you. That can only be determined with one-on-one time. So, proceed at your own risk. Should be pretty easy to follow. Working against the clock takes you out of repetition confinement, so really push to see how many repetitions you can do in (:45). Or, if you're feeling pretty taxed, slow it down and work at a pace that keeps you comfortable. Remember, high intensity interval training will push your heart rate and endurance. Train smart, friends. 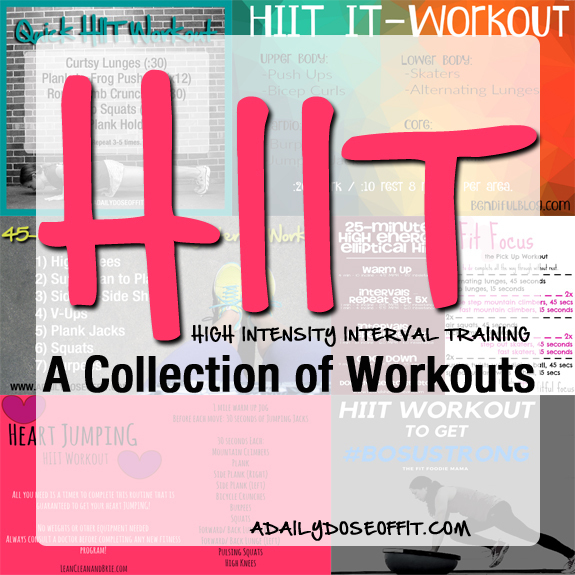 Question: How do you feel about high intensity interval training? Do you like to use equipment in your HIIT workouts? How do you feel about workouts that don't use equipment? Disclaimer: The following post is sponsored by Skinnygirl. As a Skinnygirl Savvy Snacker, I was given product and compensated for my opinions which are, of course, my own. "What are good sources of protein?" "How much protein should I eat?" "Why do I need protein?" These are great questions about protein. I get asked them pretty frequently at the gym and via Daily Dose. I'm not a registered dietitian or certified nutritionist, but I am a certified personal trainer with the American Council on Exercise. As such, I can talk about nutrition very generally without crossing any lines. And that's what I intend to do today regarding protein—because protein is a hot topic in the fitness world. Because despite the fact that our bodies can make some of these amino acids, others...known as "essential amino acids"...must come from outside sources. Protein sources, to be specific, like from meat, soy, quinoa, and peanut butter (to name a few). I'm sure you're familiar with other popular sources, too. Like powders, drinks and bars. When it comes to food, I'm very open to natural protein sources. I am, however, quite picky when it comes to processed sources (like the aforementioned powders, drinks and bars). The fitness and food industries are overflowing with protein options—and a lot of them aren't super healthy. 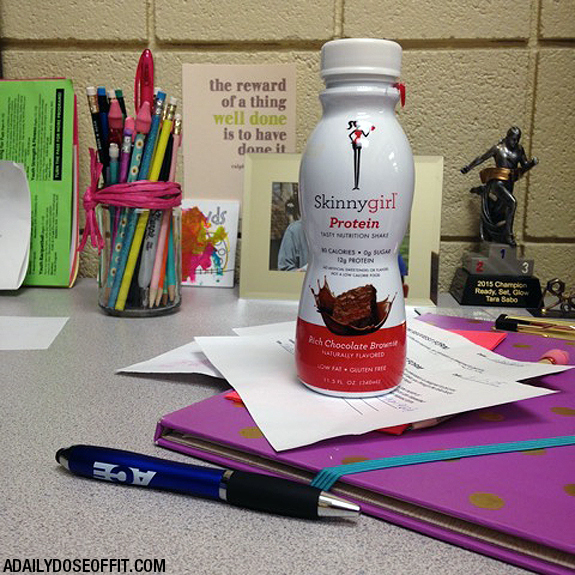 I've been really happy with Skinnygirl Snack bars in the past, so when they offered to send me the new Skinnygirl protein shakes, I got pretty excited to give them a try. I literally get ten minutes between Barre Fit and a training client. Just enough time to put some shoes on while eating a snack! And when it comes to protein-based snacks, I tend to keep mine in the 10-15 gram range. If something has more than that, it's borderline a meal. 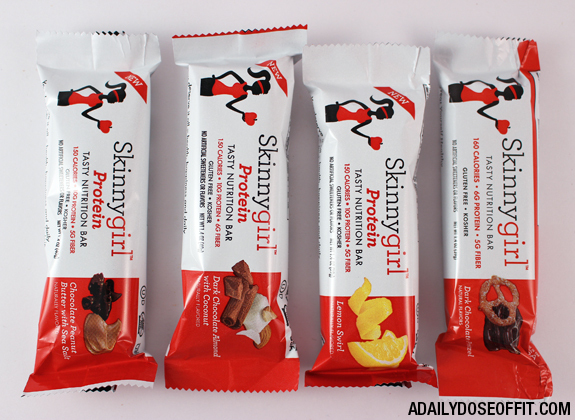 In addition to the new Skinnygirl protein shakes, the brand recently relaunched their snack bars with more protein. Every flavor has ten grams of protein. And yes, they're all delicious. But, you can't just eat 10 grams of protein. This brings me to a fine line. I don't know how much protein YOU should eat, but ACE states that the general recommendation is "0.8-1.0g of protein per kilogram of body weight per day (.4-.5g/lb)." I'll let you do the math if you wish. And remember, the body doesn't store protein, so excess protein is used quite inefficiently. So pay attention to your plate, friends. As I said before, natural protein sources rock. Like the aforementioned meat, soy, quinoa, peanut butter...there are oh, so many options. Some are better than others. This is why eating a balanced diet is good and necessary. Protein powders, drinks and bars supplement those natural sources. You just have to make sure that what you're choosing is actually good for you. Do you recognize the ingredients? How long is the list? Ask yourself these things when you're shopping. You might be surprised to discover that a protein shake is not always a protein shake. 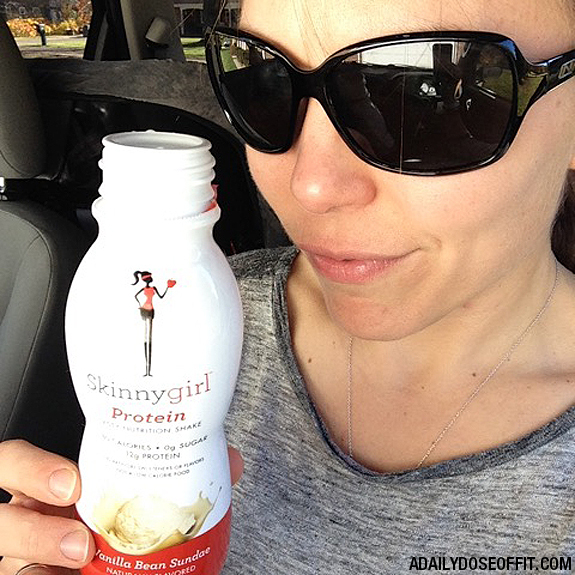 Skinnygirl protein shakes and snack bars are, comparatively, a fairly decent choice. Bottom line, protein is necessary. Do what you can to take in an amount that works for you from sources that make sense on your menu. Be sure every meal features a serving, and choose post-workout snacks that offer up a decent amount. Your body will thank you for it. 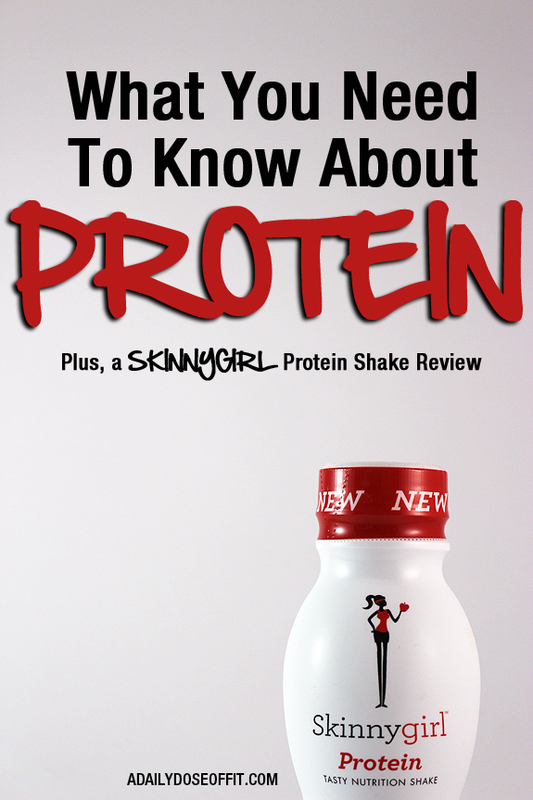 To keep track of Skinnygirl protein shakes and snack bars, connect on Facebook. 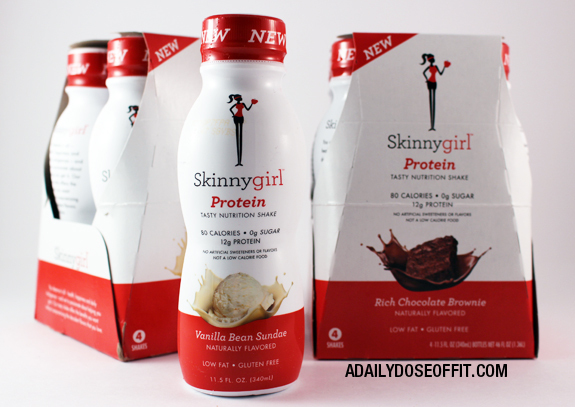 • New @SkinnygirlDaily tasty nutrition bar flavors! Question: Do you stick to natural protein sources or do you supplement with shakes and/r bars? What are your favorite sources of protein? Why does exercise feel so good? Think back to the last time you worked out. And then, think back to how you felt when you finished whatever you were doing. Despite the sweat and perhaps some muscle fatigue, you probably felt really good. Maybe even happier. And hopefully, you felt absolutely ready to take on your day or night in the best of moods. Reason why? Your workout cued up your supply of endorphins. What are endorphins? Tiny chemicals found throughout your body. They're kind of like hormones. Endorphins are produced in the brain and work to minimize your perception of pain. In fact, because of this, they are often likened to morphine and codeine—but endorphins are not addictive. This, of course, is why doctors often suggest that individuals suffering from depression hit the gym as a form of treatment. Exercise triggers the production of endorphins, and they ultimately work to promote a relaxed state of being. Makes sense, right? The more relaxed you are, the less pain you'll feel. And as you can imagine, such a state lends itself well to good moods and multiple smiles. Science and medicine will go on to describe the production of endorphins as a process that involves neurotransmitters in the brain. That's all great, but it doesn't take a scientist or doctor to understand the role that endorphins play in that feel-good state of being you get after a workout. You simply have to hit the gym to believe it. Scratch that—you simply have to move to believe it. It's not strength training alone or time spent running that triggers your supply of endorphins. It's an activity, plain and simple. Movement. Getting up and going, instead of sitting. And that, of course, is the best part about endorphins. You don't need a prescription, and they are completely free. According to WebMD, "regular exercise has been proven to reduce stress, ward off anxiety, boost self-esteem and improve sleep." Not because you successfully completed your sets and reps. Not because you upped the weight or held a plank a few seconds longer. Not even because you ran one more mile. It's because you did all of that, and your body responded by releasing endorphins. It's those endorphins that make your brain smile. Which, in turn, makes you smile. Ultimately, it's not wrong to say that exercise makes you happy, but it's absolutely right to claim an "endorphin rush" or a "runner's high." So next time you're feeling blue, remember this: Get up. Go. Exercise. Be sure to follow me on Instagram to see how I like to get that endorphin rush! 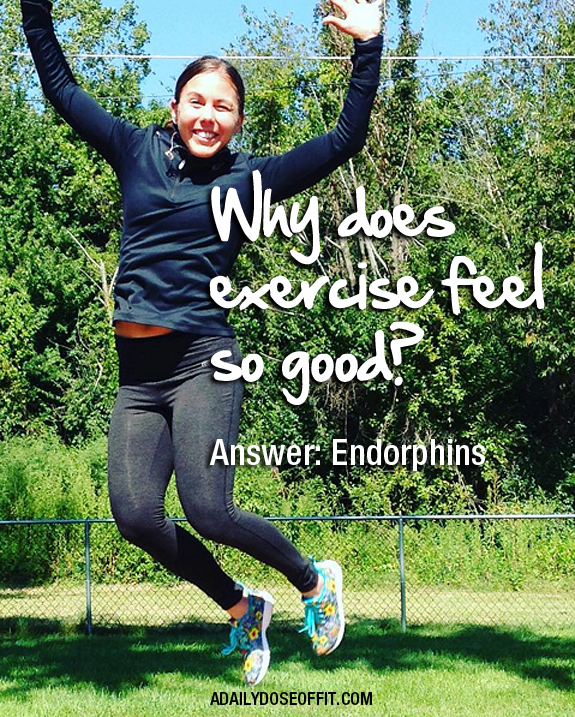 Question: Do you notice post-workout endorphins? If you're feeling down, is there a go-to exercise and/or workout that you turn to for a pick-me-up? 1) I know I will never read them again. Ever. 2) We need to make room in the basement for toys. End goal: Playroom. The KonMari method urges you to discover that which sparks joy, and to essentially shop what you have. Meaning, you pile everything up and keep what you want. And since I want all books everywhere, well...you get how difficult this task was for me. But, I somehow managed to get it done. So what's left in my collection? Classics, like Gone with the Wind. I have three copies (and need all of them). Favorites, like Sweet Valley High #1. Because I loved this series when I was little. Also, a ton of books that inspire me. 2) The Eat Clean Diet Presents: Just the Rules! (Tosca Reno) Much like the first book, this one is quick and concise, too. And yet, it's full of information. I recommend it to my clients when they express frustration with their diet. I tell them to stop dieting, to start eating right...and I tell them that this book is a great way to understand what those two things mean. I flip through it every once in a while when I feel like I need a friendly reminder. Note: There are a ton of pictures and graphics (things that always make reading fun). 3) In Defense of Food: An Eater's Manifesto (Michael Pollan) This book is crazy good. Pollen is a fantastic writer, very descriptive (even when he's talking about scientific things). His main goal? To show us that "thoughtful food choices will enrich our lives, enlarge our sense of what it means to be healthy, and bring pleasure back to eating." It all boils down to this: "Eat food. Not too much. Mostly plants." 4) The Shack (William P. Young) This book is for those of you that think about God. It's a work of fiction, and you won't be able to put it down. Through a tragic story, it compels the reader to ask where God is in a world filled with pain. According to one review written on the back cover, "The Shack will leave you craving for the presence of God." And it does. 5) Wild (Cheryl Strayed) I always prefer books over movies, so I will (of course) urge you to read this one before you see the flick. It's a most excellent story about a woman that overcomes herself to achieve something so awesome. She literally proves to herself that her hopes and dreams are possible and, thankfully, she wrote about it along the way. Read this if there's something you've always wanted to do, but haven't yet mustered up enough belief in yourself. 8) Train Like a Mother: How to Get Across Any Finish Line—and Not Lose Your Family, Job or Sanity (Dimity McDowell and Sarah Bowen Shea) Obviously an extension of the first, it takes all the aforementioned information about running and expands on it by giving the reader multiple training plans well-suited to all the popular distances. I did a combination of the two half marathon plans this Summer and completely enjoyed the workouts. 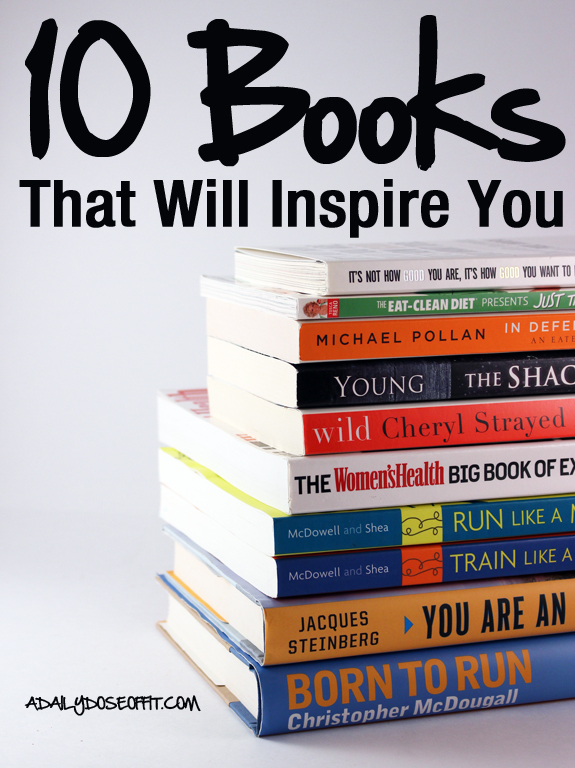 I will definitely be referencing these books again when I start to train for my next race. 9) You Are An Ironman (Jacques Steinberg) Let's be clear on one thing: I am NOT an Ironman. 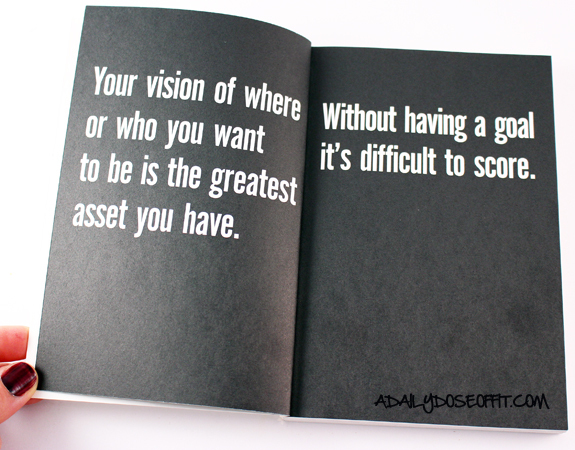 And I have no goals to become one, no thanks. But that didn't stop me from getting totally engulfed in this book. It's much like Wild in that it will make you want to achieve your goals and make your dreams come true. It follows six "weekend warriors" and details their road to the finish line of an Ironman. So good. 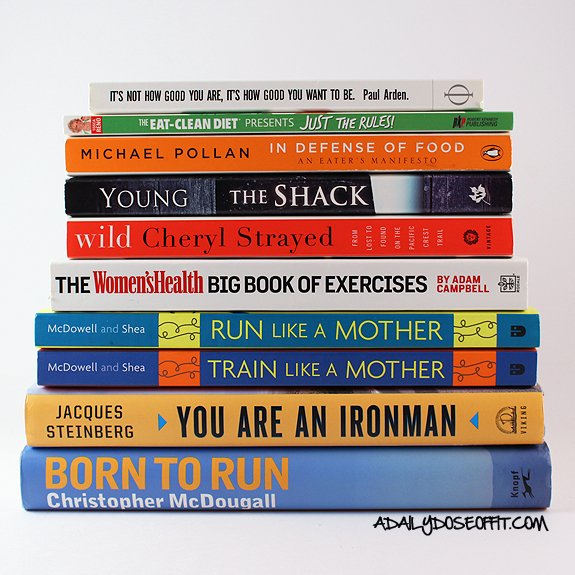 10) Born to Run (Christopher McDougall) If you run, no matter the distance, then you need to read this book. For real. It's a non-fiction book that reads like fiction, it's that good. And even though I generally prefer the book over the movie (see above), I'll probably head to the theatre for this one because #matthewmcconaughey. Question: What book are you reading right now? You can click HERE to see what all my friends are reading.